The root canal is probably one of the most misunderstood procedures in all of dentistry. These days, thanks to advances in technology and techniques, the root canal is far less uncomfortable than in the past, but it still holds on to its bad reputation. Did you know that, according to a study performed by the American Association of Endodontists, patients who had never actually received a root canal were six times more likely to call the procedure “painful” as compared to patients who had received root canals? Root canal therapy is an incredibly useful procedure, and it allows us to save a tooth that might otherwise be lost. This not only saves you the stigma and embarrassment of a missing tooth, it also saves you plenty of time and the cost associated with replacing the tooth. But what exactly is a root canal? Although the root canal therapy procedure is often simply referred to as “having a root canal,” the root canal itself is actually a part of the anatomy of your tooth. The canal is found in the pulp chamber, a natural space in the center of your tooth that holds the nerve of your tooth. If your tooth is damaged by trauma, decay, or an infection, the root canal and the nerve of the tooth can become damaged. When this happens, the result is pain and sensitivity in the tooth and adjacent gums. If the nerve dies, however, you may not experience any pain. In this case, we can spot the infection or damage on an x-ray, and we’ll let you know what’s going on. The purpose of root canal therapy is to open up the tooth, remove the damaged nerve to stop the pain, clean out any infection or matter from the inside of the tooth, and then seal it back up again. Once this is done, the tooth may need a crown to protect and support it, and we can help you with that too. 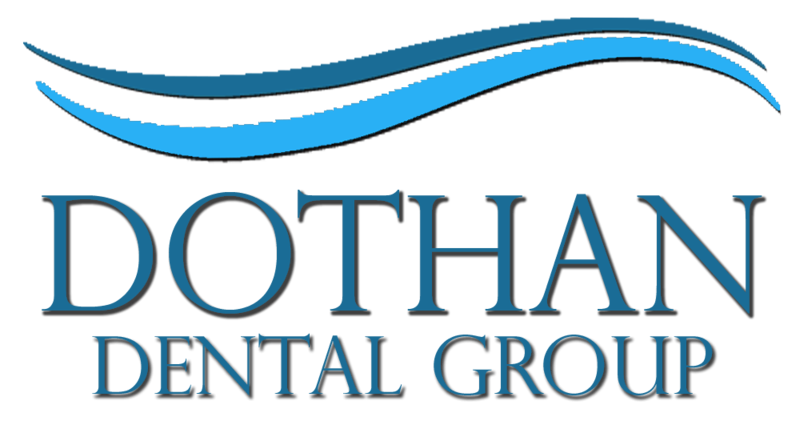 Thanks to the experience and skill of our Dothan Dental Group dentists, you are unlikely to feel anything during the actual procedure. While you may experience some discomfort and swelling following the procedure, this is a product of your body’s own healing process. Once your immune system gets the message that the infection or damage is taken care of, you’ll feel much better, and we can give you some medication to help out in the meantime. If you are experiencing pain in a specific tooth, call our office immediately so we can check for the problem. We offer same-day emergency appointments, and we’ll get you in as quickly as we can. Dr. Matthews or Dr. Prim will inspect your tooth to see if a root canal is necessary. As mentioned, sometimes we notice that a root canal is necessary during a routine examination because we can see that the nerve has died. This is another reason why it’s important to see the dentist on a regular basis. Catching a problem like this early allows us to take care of it quickly so that the decay or infection doesn’t spread and affect other teeth. Call our Dothan dental office today to schedule your check-up or emergency dental appointment. We’ll take care of you and quickly relieve your pain so you can get back to your life.